July 13, 2016, 1:24 p.m.
Here’s some good news and bad news for publishers losing sleep over the rise of adblocking: The good news is that most people don’t hate all ads. The bad news is that, no, they won’t turn off their adblockers, even if you beg them. 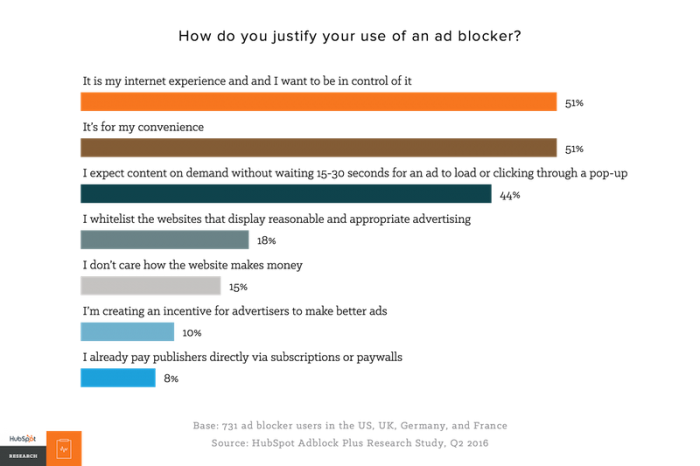 This is according to a new survey from AdBlock Plus and marketing company HubSpot, which quizzed both users and non-users of adblocking plugins on why they use (or don’t use) the tech. While the likes of PageFair regularly release macro data on adblocking trends, there has been less data about the motivations of users themselves. HubSpot surveyed 1,055 people in the U.S., U.K., Germany, and France, 70 percent of whom were adblocker users. 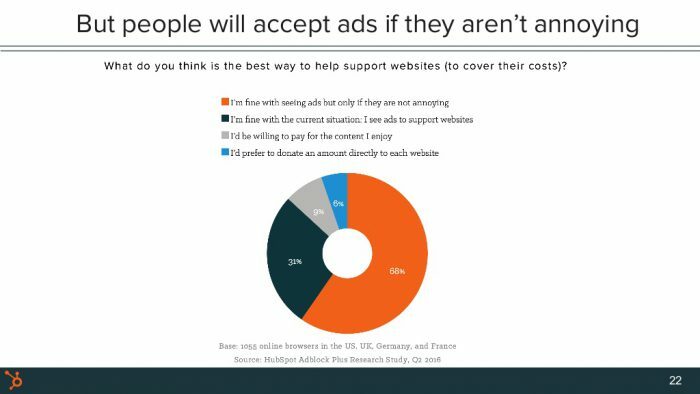 — Users’ main justifications for adblocking? A tie: People say they want to be in control over their browsing experience, and they like the convenience. It seems that for most people installing an adblocker in their web browser is no different from installing a password manager or a Chrome extension that blocks all mentions of Pokémon Go: It’s a way to optimize and be in command over the experience. — The younger you are, the more likely it is that you actively whitelist certain sites. Young people are most likely to install adblockers. But according to the the survey, 65 percent of young people stay they will whitelist sites at least some sites. Just 51 percent of people 45-54 and 43 percent of people over 55 said the same. 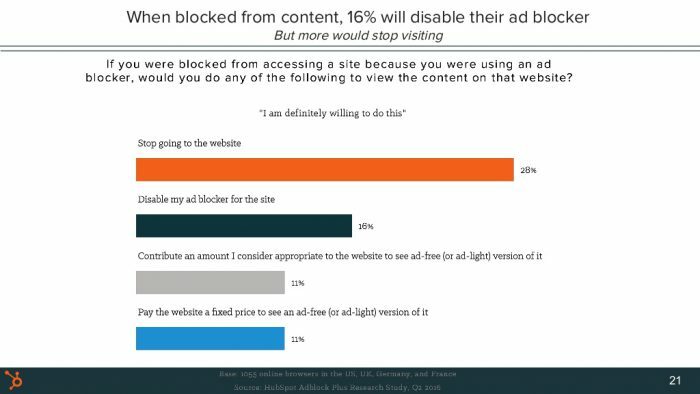 — No, they won’t turn off their adblockers: For many people, the desire for control over their browsing experience trumps publishers’ need to make money: 32 percent of people said they wouldn’t turn off their adblockers under any circumstances, while 30 percent would do so only if they couldn’t access certain websites otherwise. 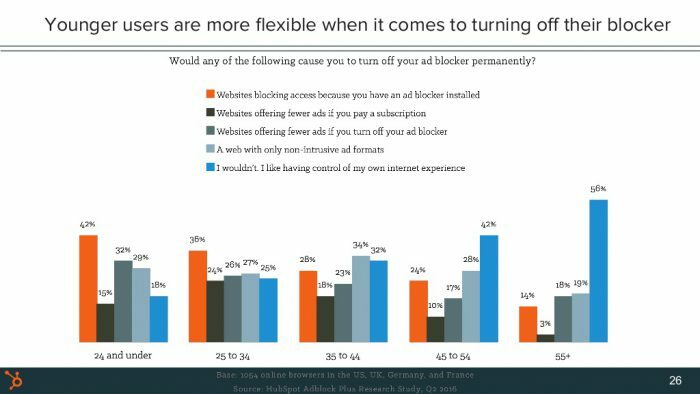 Still, people said that if a site forced them to turn off an adblocker before they could read it, 28 percent of people said they were more likely to stop visiting that site entirely. Sorry, Forbes. Bilton, Ricardo. "Here’s how people who block ads justify it: Convenience, control, and avoiding slow load times." Nieman Journalism Lab. Nieman Foundation for Journalism at Harvard, 13 Jul. 2016. Web. 20 Apr. 2019. Bilton, Ricardo. "Here’s how people who block ads justify it: Convenience, control, and avoiding slow load times." Nieman Journalism Lab. Last modified July 13, 2016. Accessed April 20, 2019. https://www.niemanlab.org/2016/07/heres-how-people-who-block-ads-justify-it-convenience-control-and-avoiding-slow-load-times/.